For many a home in the sunny and warm state of Florida is a lifelong dream. Who wouldn’t want to protect that dream to the best of their ability? One way to ensure your efforts are secure and safe is with Florida home insurance. Let RTC Insurance Advisors help you find the right company. Get your free quote today. Our quote form below is quck and easy. 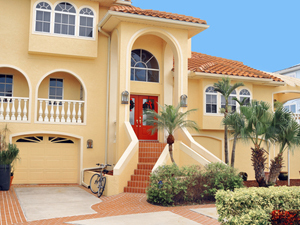 Florida home insurance is not required by Florida law, but no one wants to risk their home and everything inside it. Not only does homeowners insurance pay for your lost property in the instance that it is damaged, but it also offers the homeowner protection against liability suits. If you have a swimming pool or pets, then liability insurance is just a smart thing to acquire. If you have a mortgage or lien on your home, most lenders will require full insurance coverage both on the dwelling itself and on any surrounding structures. Many developments, particularly those with homeowners associations, may require insurance whether or not you have a lien against your home. You could get a quick quote now, or read more below about a few things you need to know when selecting Florida home insurance for your property. After receiving multiple Florida home insurance rates, coverage may vary from company to company, but the basic packages will all contain clauses for property damage from fire, wind, or theft. These things will cover the dwelling itself, outlying structures such as sheds or garages, and personal property. Your home, outbuildings, and your home’s contents are considered “property”. We can answer any further questions you may have. You should be aware that your Florida home insurance policy may not include things such as antiques, firearms, jewelry, or other items that constitute extra expense. For these types of items you may have to purchase additional coverage. It is a smart financial move to purchase extra insurance for really expensive antiques, jewelry, electronics, or other high priced items. Talk with one of our agents about it today. In some cases, a homeowner’s policy will pay additional expenses if the damage to your home prevents you from actually living in the structure. In most cases a civil authority, such as an emergency management service, will have to declare the dwelling uninhabitable. The extra coverage typically includes food, housing, telephone, transportation, and temporary living arrangements. Read your policy carefully to determine what it will and will not cover. You will receive it in the mail after we deliver your Florida home insurance rates and the policy is bound. Another feature of the plan that accounts for a portion of Florida home insurance rates is the personal liability coverage. Homeowner’s policies normally protect you from a claim or lawsuit resulting from bodily injury or property damage to others. For example, if you own a dog and the animal bites or otherwise cause injury to a neighbor or visitor, you get sued, and a jury finds you liable the coverage will pay the claim and legal fees up to the policy’s limit. This does not include any intentional harm done by you or your family. Speak with us to learn the limits and exclusions for your Florida insurance policy. There are many more facets to a Florida home insurance policy, but these are a few of the topics that you should be aware of and might want to learn more about. It is always wise to read through your insurance documents carefully so that you understand your coverage. Don't forget to get a quote with us now.